P is a brand with traditions in the manufacture of business laptops where reliability and premium performance go hand in hand. 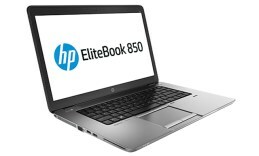 Recently the company has filled its EliteBook portfolio with a few brand new models. Today we are looking at the 15-inch EliteBook 850. The redesigned EliteBook machines are slimmer and lighter than the previous generation, but they still keep the durability typical of the portfolio. Despite their sophisticated looks, coming in graphite black color, the new EliteBook machines continue to meet the military standards for ruggedness and durability. The new shell is made of magnesium alloy in combination with aluminum accents. The new face of the lid has a nice and smooth matte surface. The interior also suggests premium build-quality. The island-style keyboard has an aluminum deck. Since a corporate-friendly machine like this one is supposed to provide maximum long-term comfort, the keys have a back lighting. The touchpad is placed to the left below the keyboard. It has a standard design – a scroll surface along the right border and 2 pairs of auxiliary keys, which are user-customizable. To the right of the touchpad there is one necessity in business class machines – a fingerprint reader. The laptop sounds really good thanks to DTS Studio Sound technology. The 15.6-inch display offers FullHD resolution. The density of the pixels achieves great sharpness at 141ppi. Although it’s a business-orientated machine visual performance is on a high level. Pixelation is hardly noticeable and the colors are tru-life, by no means oversaturated. Again the business spirit of this machine results in narrow viewing angles of the display – 160 degrees. The contents displayed on the screen are not visible by the person sitting next to you so that maximum privacy of the information is provided. Just above the display an HD webcam is placed. It’s important to mention that our machine meets Intel’s Ultrabook requirements. Here is why: for internal storage you can choose between SSD, HDD or hybrid hard drive. 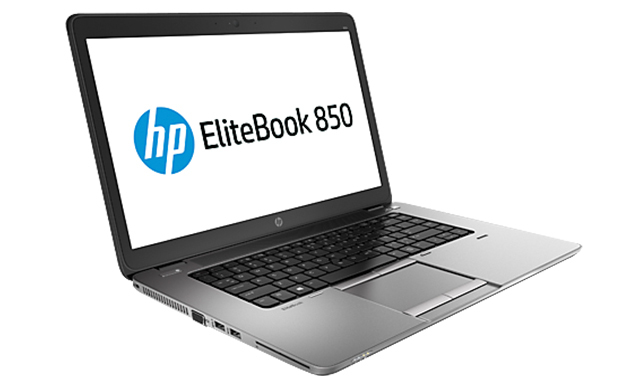 EliteBook 850 comes with the latest fourth generation Haswell processors by Intel. They achieve great results both with performance and visuals as well. Our test machine is powered by a dual-core 64-bit Core i5 4200U at 1.6GHz. The overclock frequency reaches 2.6GHz. This model is also available on the market with the more powerful Core i7 processor. 850 supports up to 16GB of system memory. The latest Intel HD Graphics 4400 is responsible for the visuals. The hardware update to latest generation processors and graphics cards inside EliteBook 850 is obvious the second you challenge it with streaming high-definition videos and professional software. EliteBook 850 offers a full package of ports and slots: 4 USB ports v3, a VGA port, a card reader, headphone and microphone jacks and even a docking connector. The machine weighs 4.15 pounds.